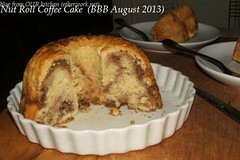 I'm wondering if this month's BBB bread is what Marie Antoinette had in mind for those who couldn't eat bread.... 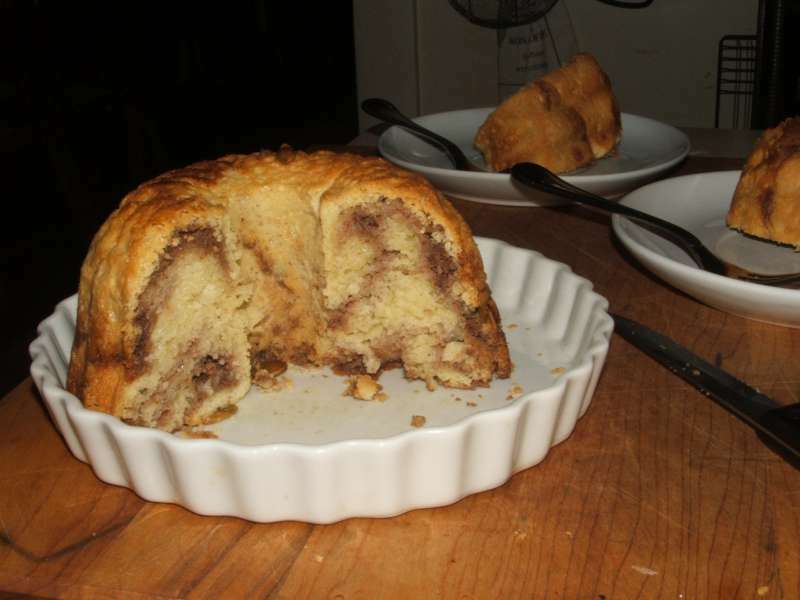 It is a rich buttery brioche-like cake with swirls made from eggwhites, not too much sugar, cinnamon and ground nuts - in this case, pecans. 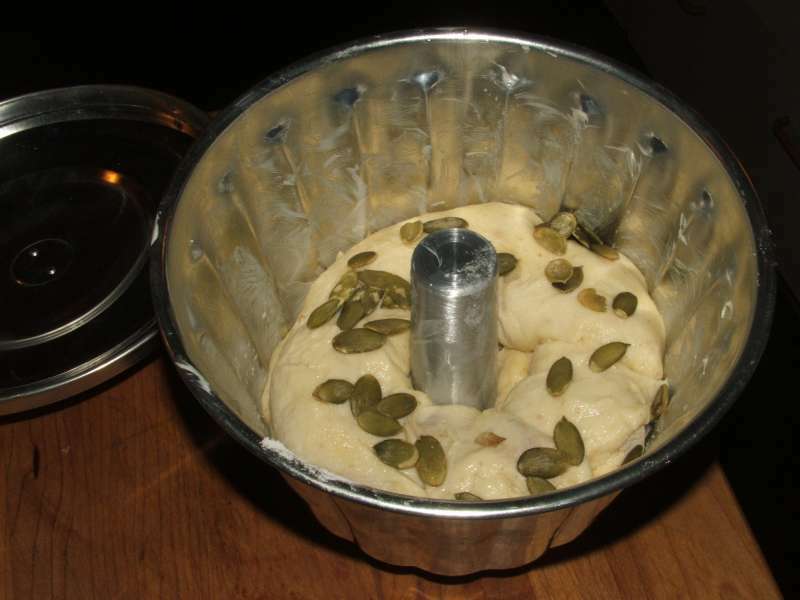 The no-knead yeasted dough is mixed the night before and the cake assembled the next day and baked in a tube pan. 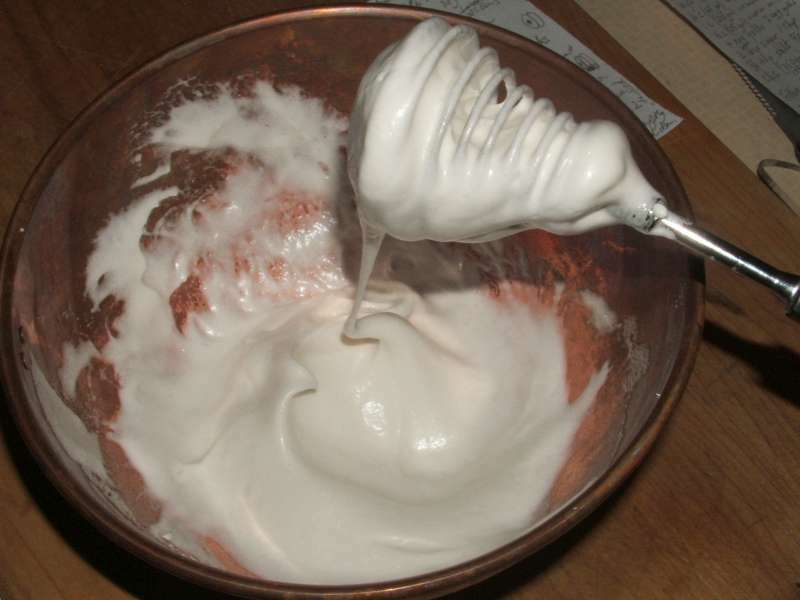 To begin making the filling, the egg whites had to be whisked to soft peak stage before gradually beating in the sugar to make a shiny meringue. 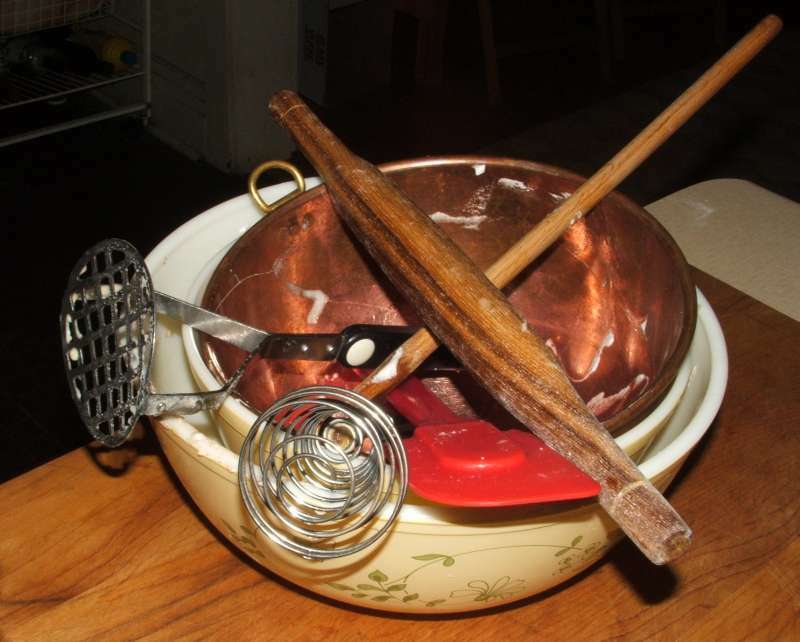 Our copper bowl and French whisk made the task incredibly easy. 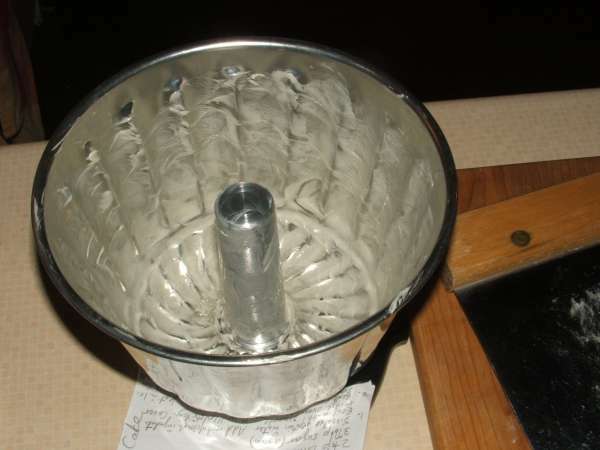 The cake is to be baked in a tube pan. 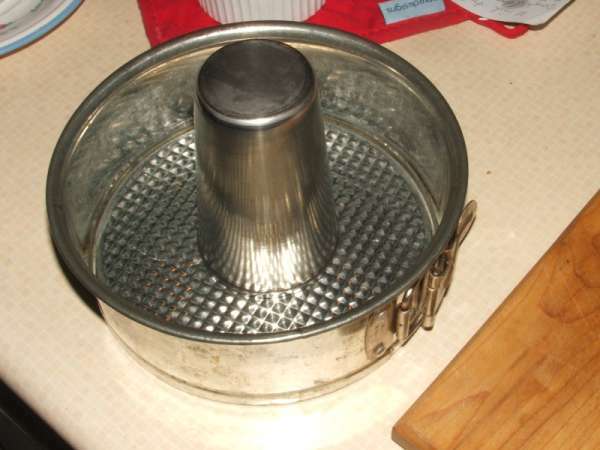 Because I was making only half the recipe, I thought I would have to use Tanna's (my kitchen in half cups) brilliant idea to manufacture a pan using our small spring form pan and a metal cup. While I was ransacking the cupboards for bowls, etc, I came across a pudding container that I rescued from Mum's kitchen when we were clearing out our parents' house a couple of summers ago. It's perfect! 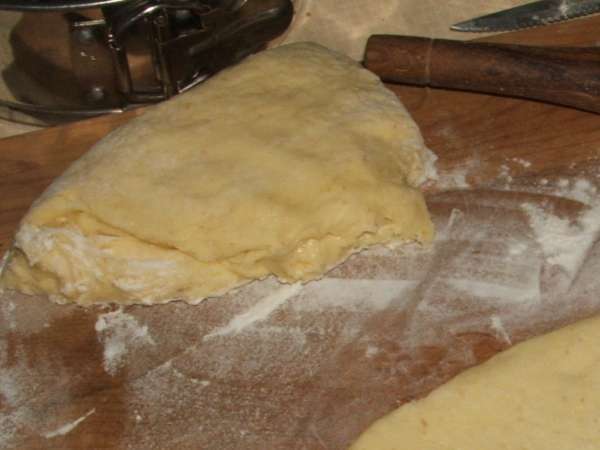 Divide the silky soft dough in two and roll out into rectangles. 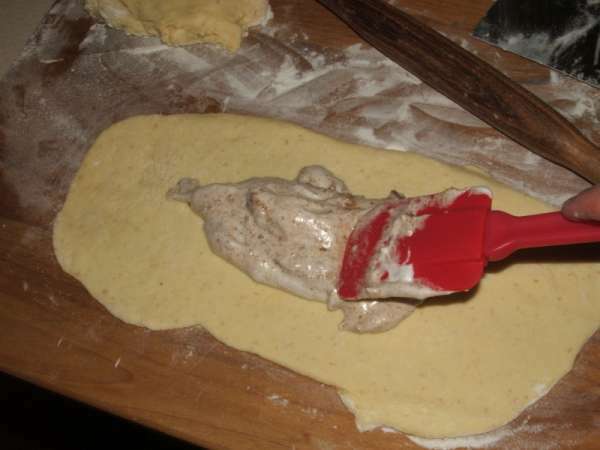 Carefully spread the meringue mixture over each rectangle, leaving a space at the edges to seal the dough. 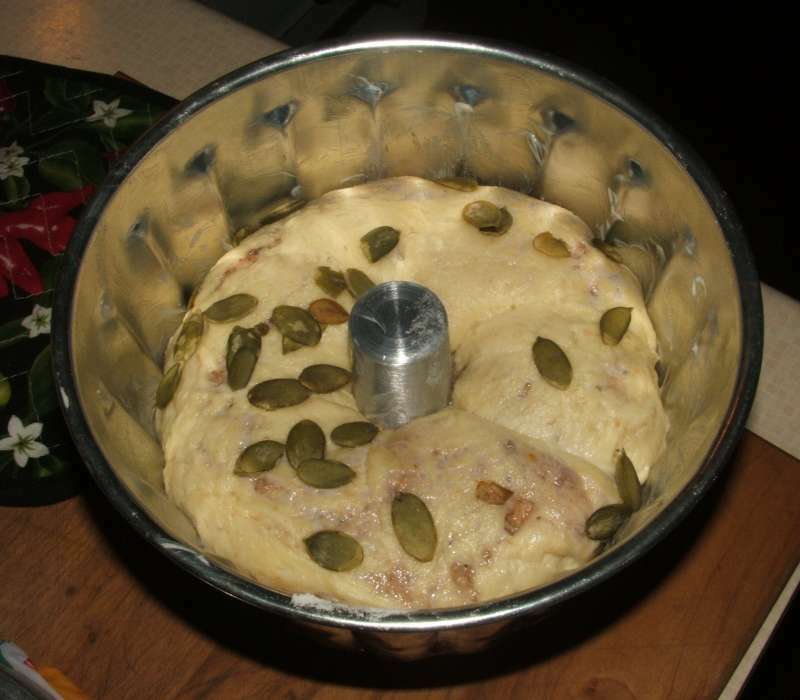 We left it on the counter for a couple of hours to rise. 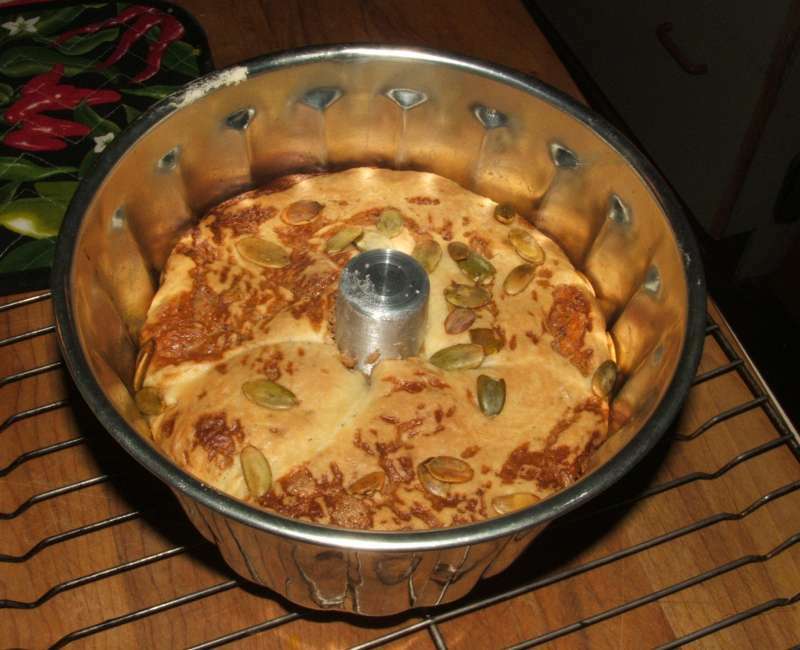 Here it is ready to be baked. Here it is just out of the oven. 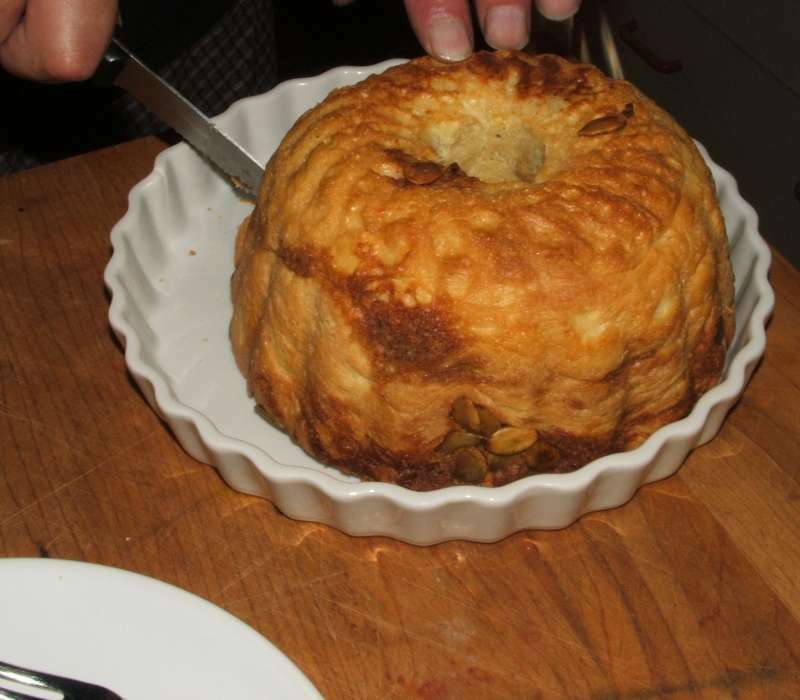 It smelled divine! 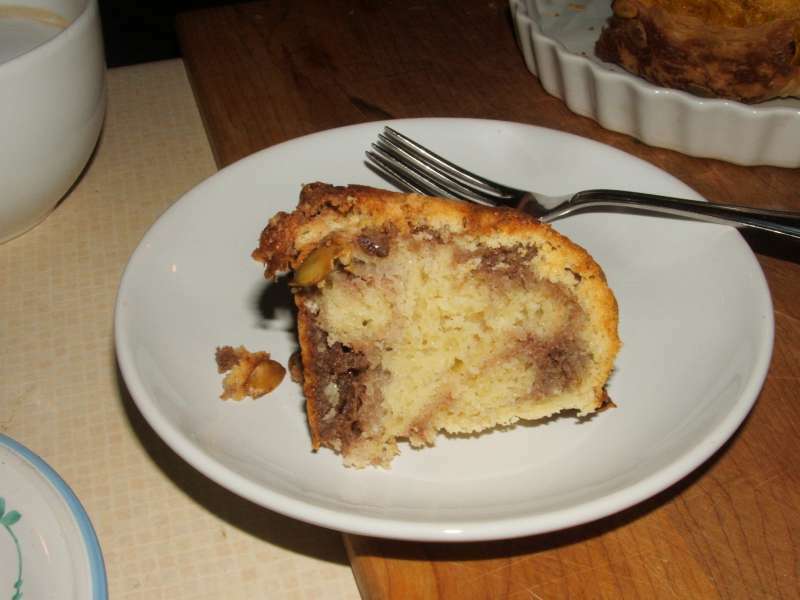 We left the cake to cool in the pan for about twenty minutes and then turned it over onto a rack to continue to cool completely. It popped right out! 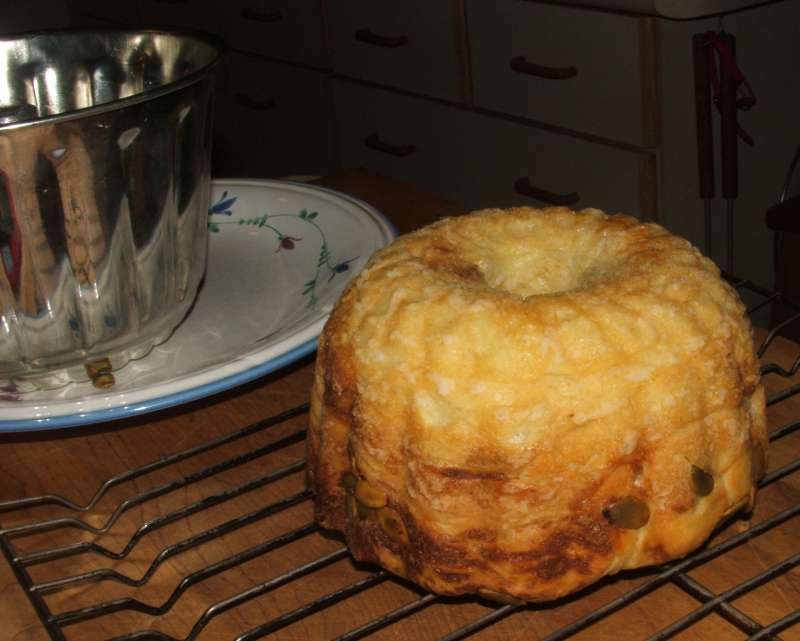 The next morning, we decided that the cake wasn't quite done so we stuck it in the toaster oven to warm it up and give it a golden tinge all over. It was brilliant! Wow! This is so good that we had to come back for seconds. Now I'm sorry that I only made half the recipe!